Revolution Flag Group in conjunction with the Detroit Public Safety Foundation donates over 50 American Flags to Detroit Police & Fire Departments. 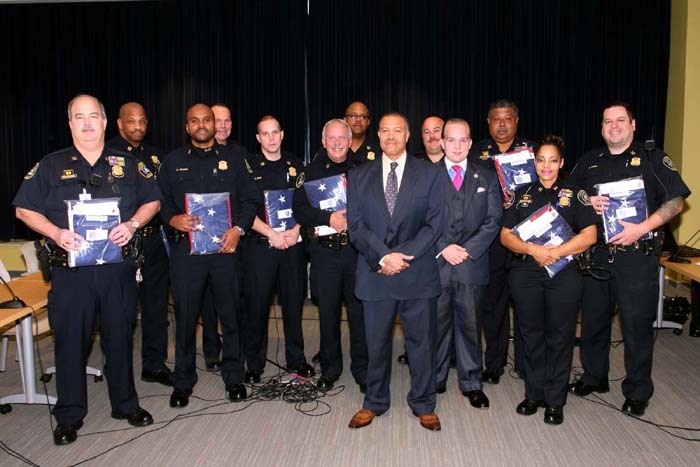 Detroit, MI September 18, 2014- Revolution Flag Group a Southeast Michigan based flag and flagpole installation company has donated over 50 American flags to the Detroit Police Department and Detroit Fire Department. In conjunction with the Detroit Public Safety Foundation, Revolution Flag Group donated over 50 American flags to replace the tattered and worn flags at all 16 Detroit Police Department precincts and outposts. The donation will also cover all the 40 Detroit Fire Department fire houses. Revolution Flag Group President Michael Soviak said, “We at Revolution Flag Group are big supporters of our first responders and we are happy to ensure that the individuals that protect us day in and day out will have brand new American flags where they work.” A ceremony with the presentation of the flags occurred on Thursday September 18, 2014 at the Detroit Public Safety Headquarters, 1301 3rd street Detroit, MI at 10:30 A.M. Detroit Police Chief James Craig and Fire Commissioner Edsel Jenkins along with members of the police and fire departments were in attendance to receive the donation. Soviak said, “It will be an honor to be joined by Detroit’s finest along with members of the Detroit Public Safety Foundation when we present the new flags.” This donation will ensure that police precincts and fire houses throughout the City of Detroit will have brand new crisp American Flags flying proud. Revolution Flag Group co-founded by Michael Soviak and Constance Soviak in 2009, is a business that installs flags for businesses and personal customers as well as flagpole installation. The company is a full service flag maintenance company that is based in Southeast Michigan. The Detroit Public Safety Foundation is a 501 © 3 that’s mission is to raise funds to improve the public safety in the City of Detroit.